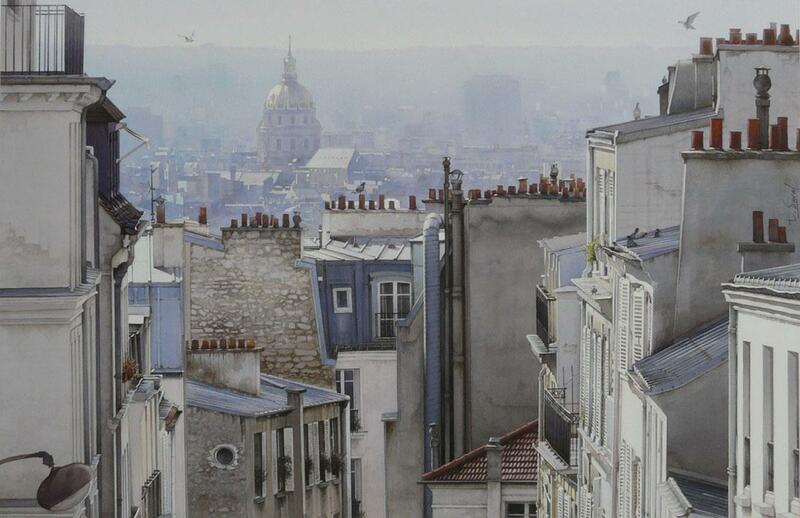 Thierry Duval was born in Paris, France. 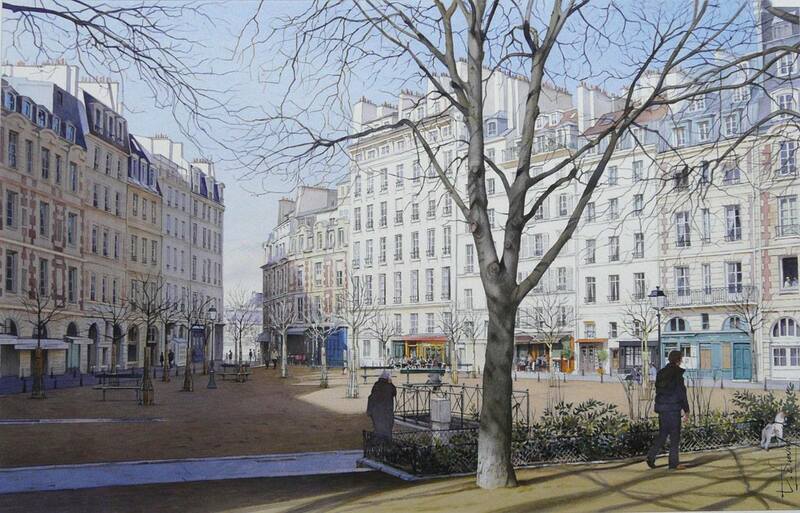 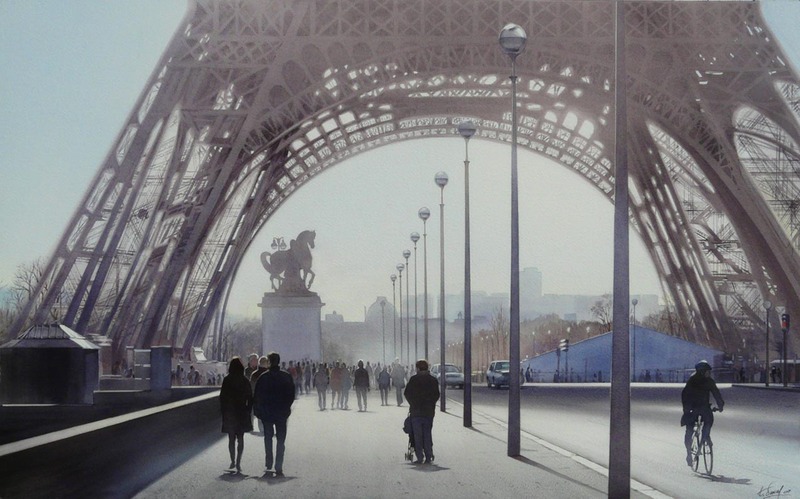 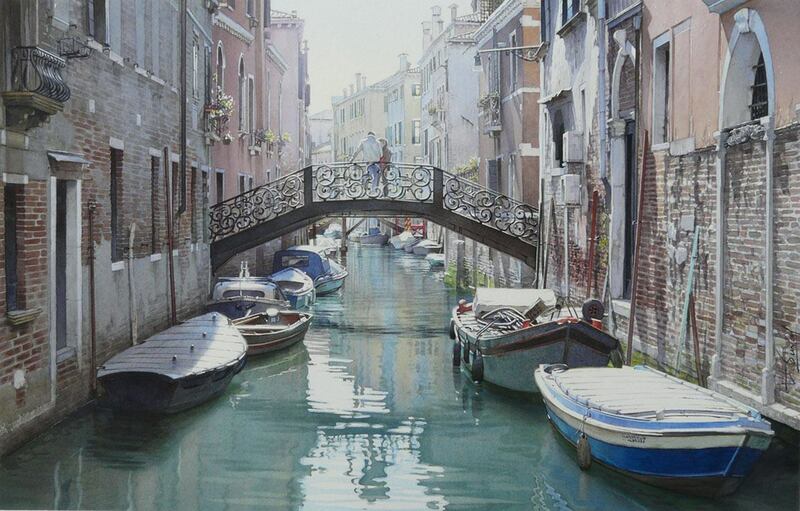 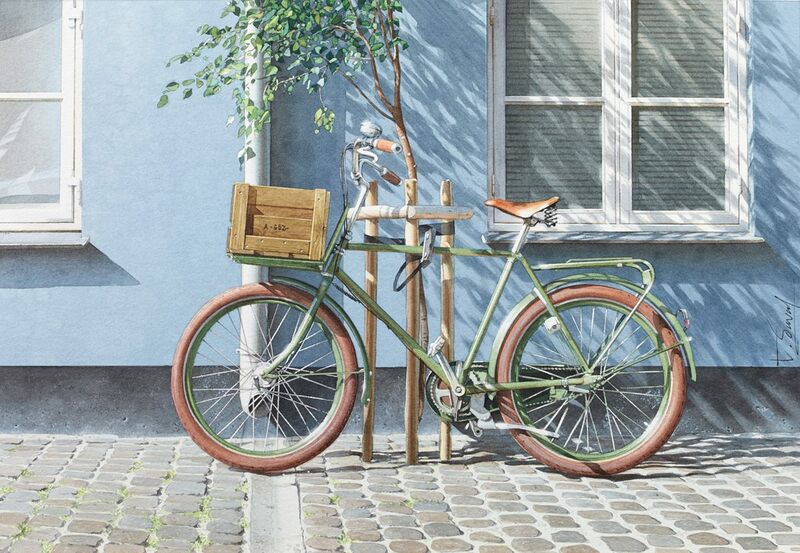 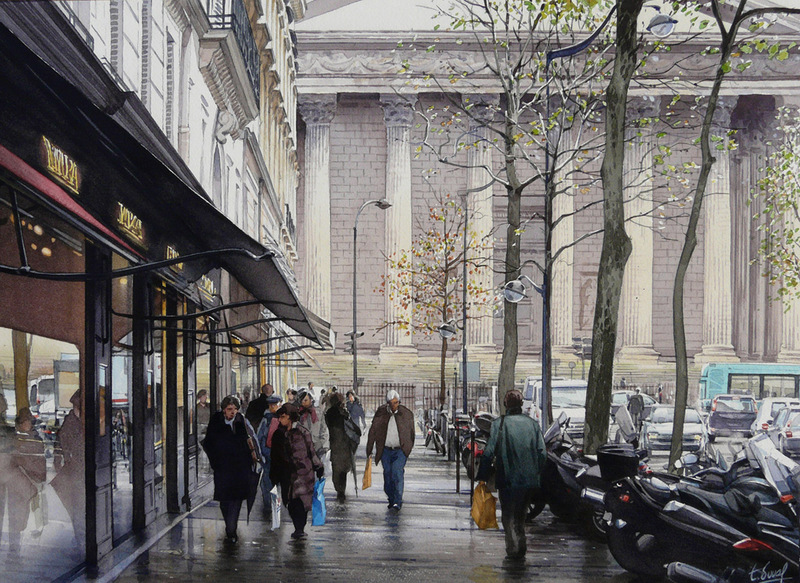 His watercolors are characterized by a strong light and precision in drawing, being almost or hyperrealist in the results mainly in his Paris watercolors. 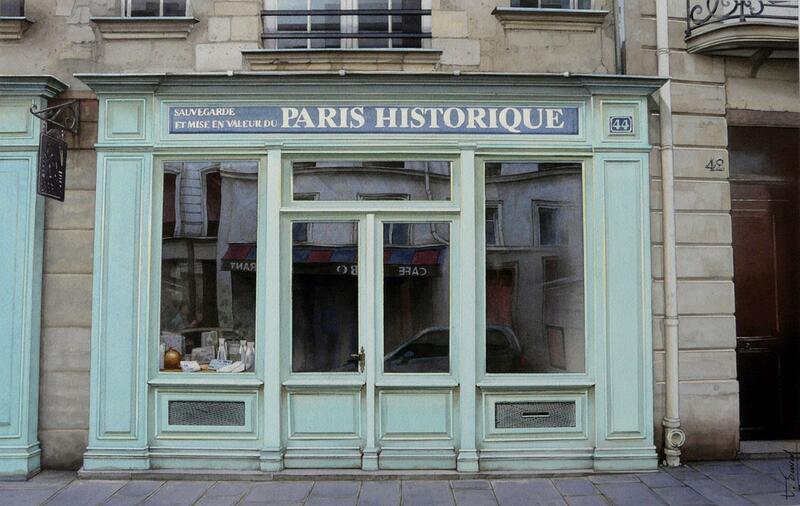 By using glazing technique he works in several steps up to get the final, very realistic result. 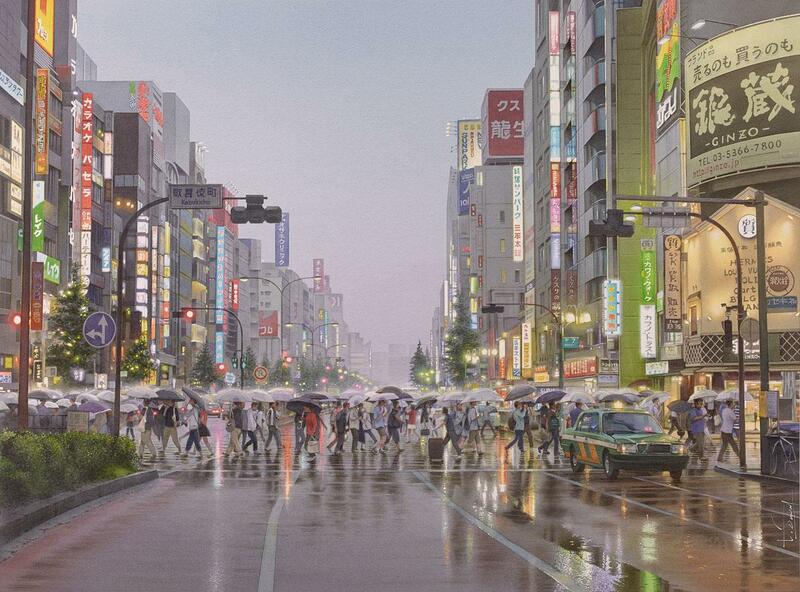 As was said, light is strong in almost all his artworks. 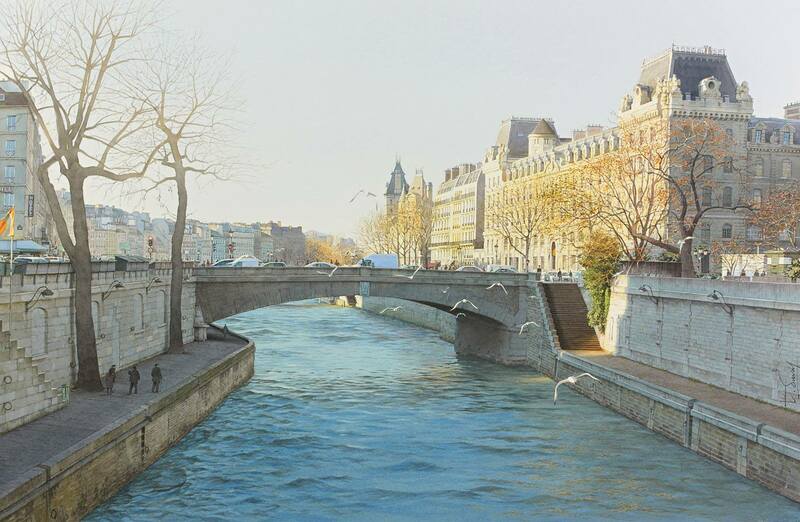 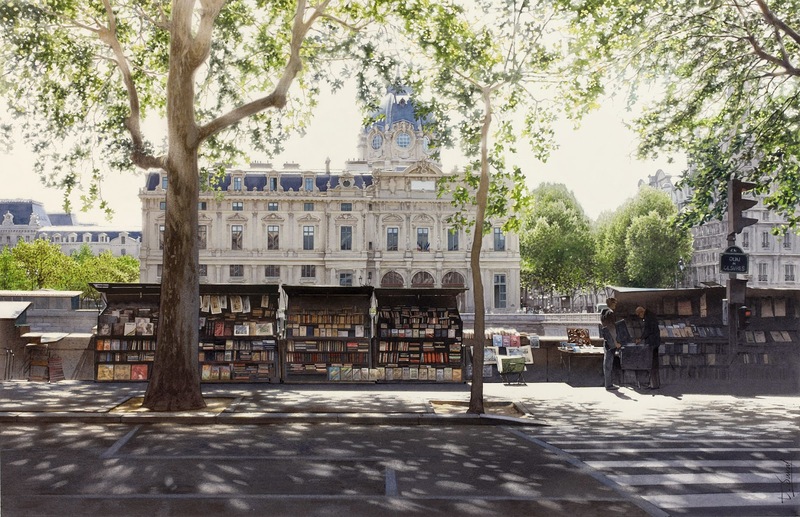 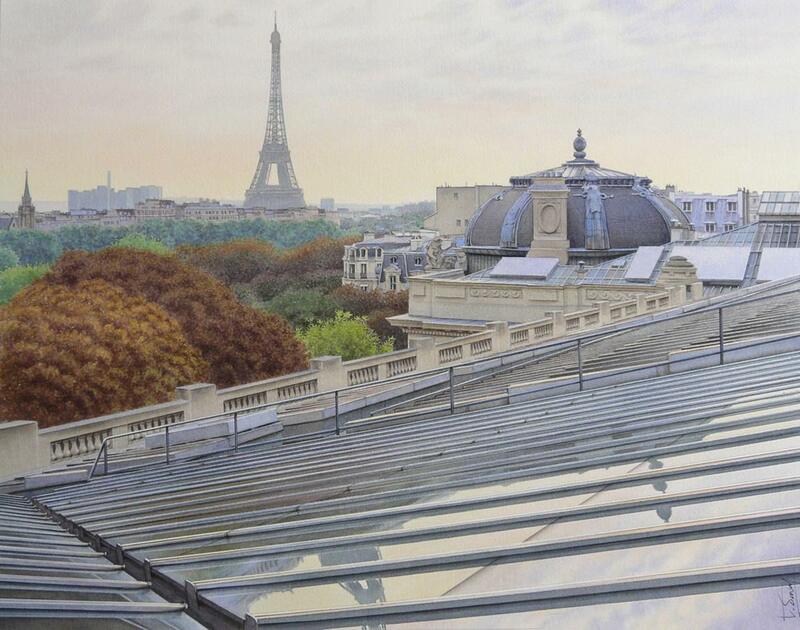 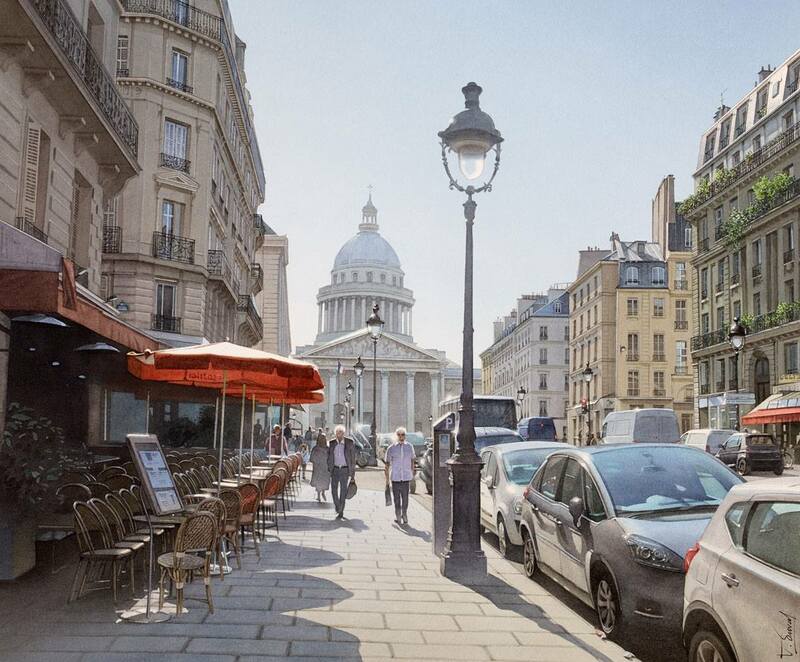 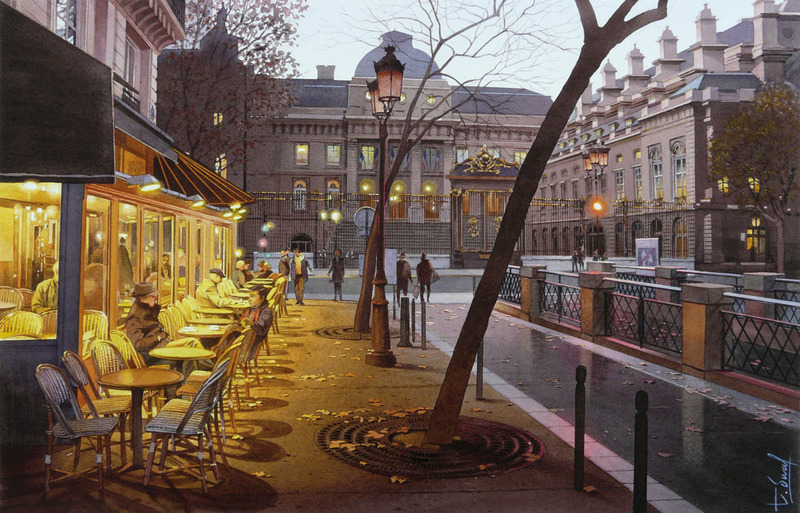 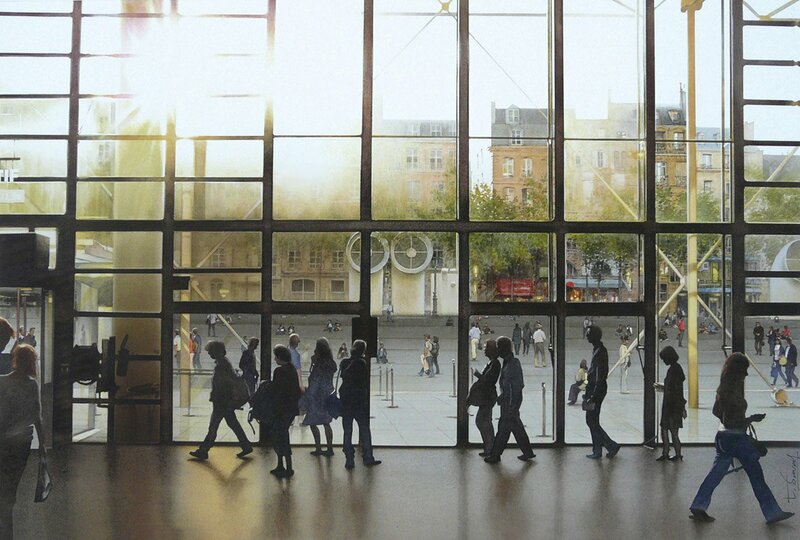 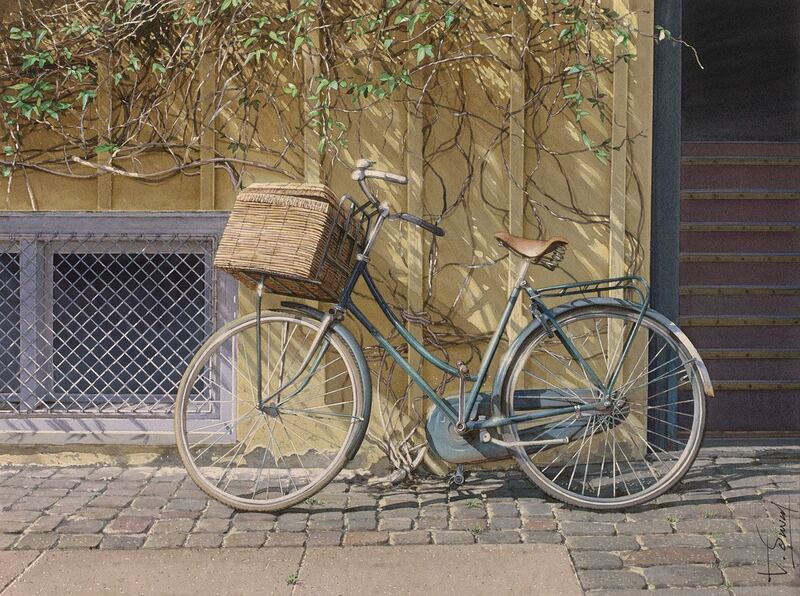 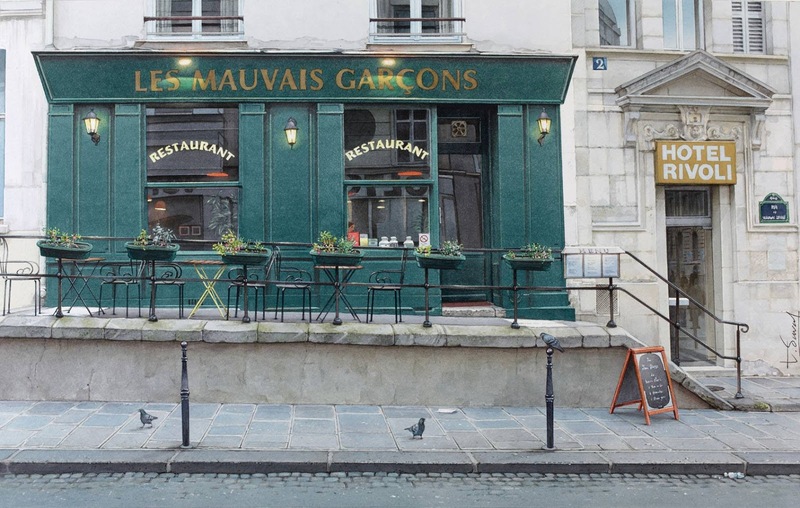 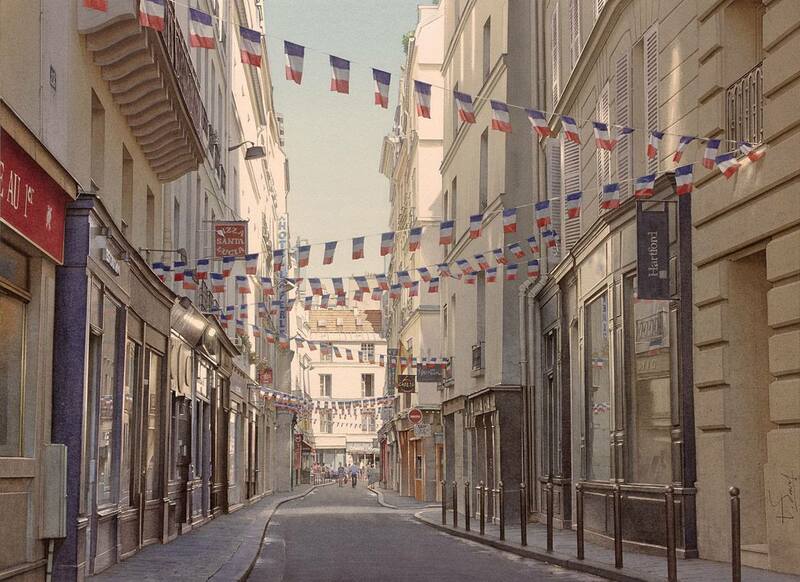 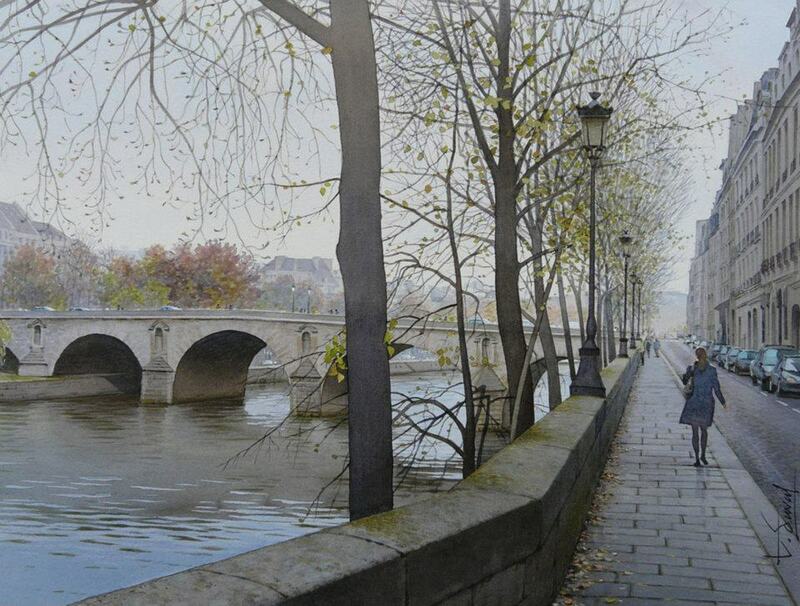 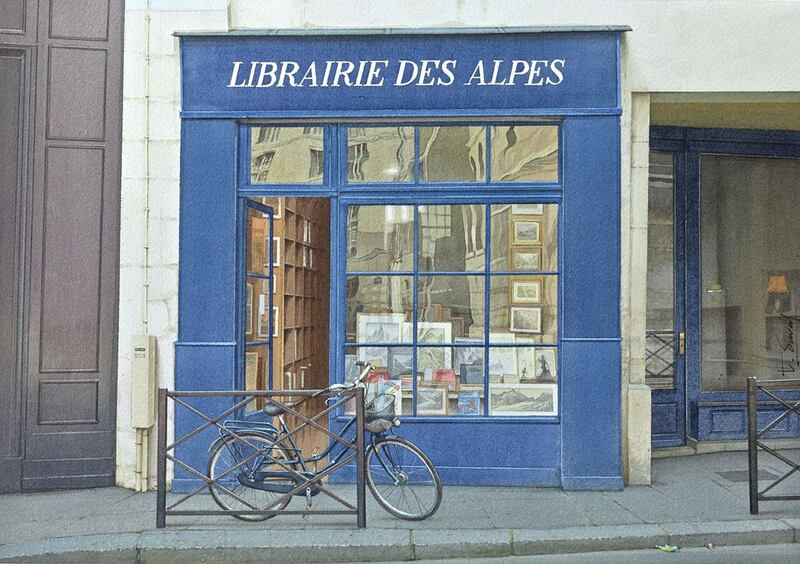 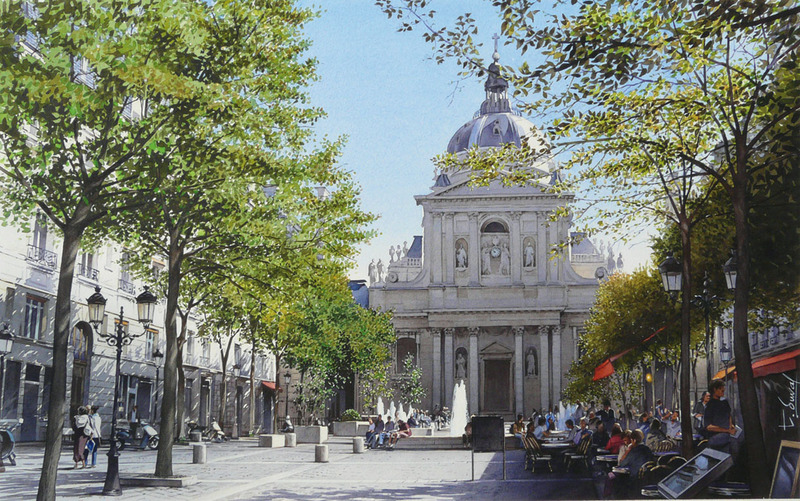 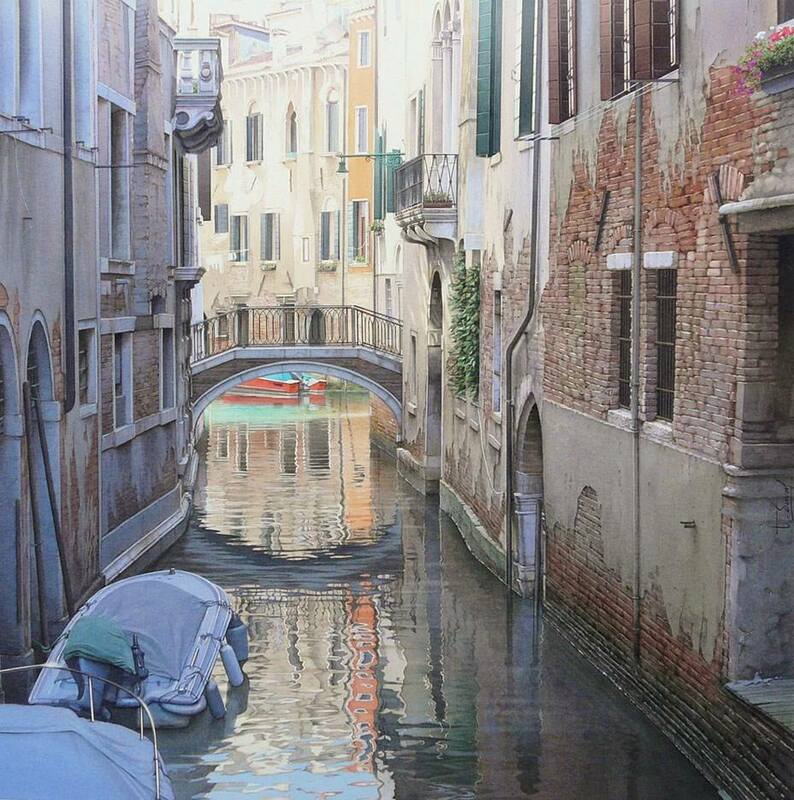 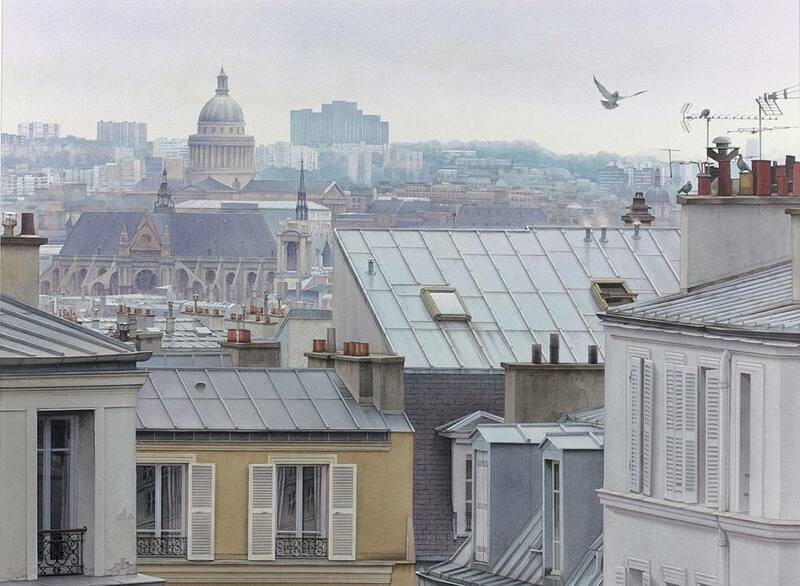 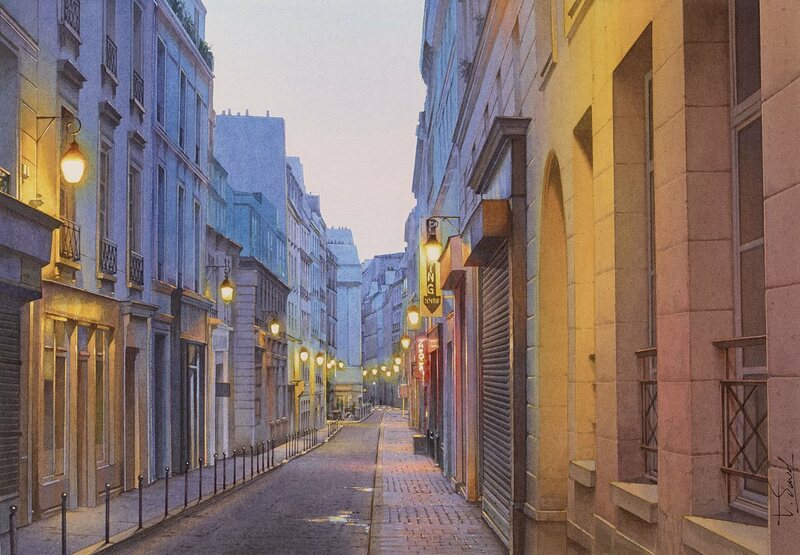 Thierry Duval is a sensitive and accurate observer of nature and the city. 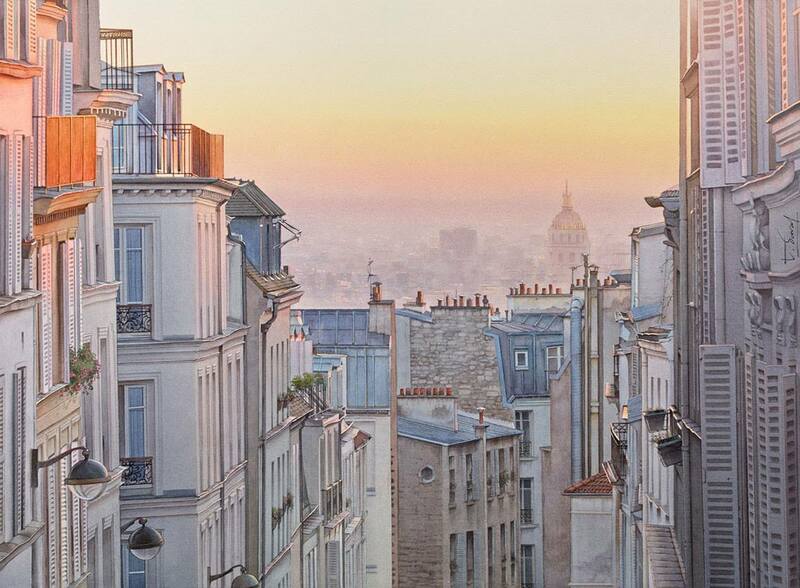 Paris is painted in depth streets, buildings, cats, bridges, all you can imagine about this wonderful city. 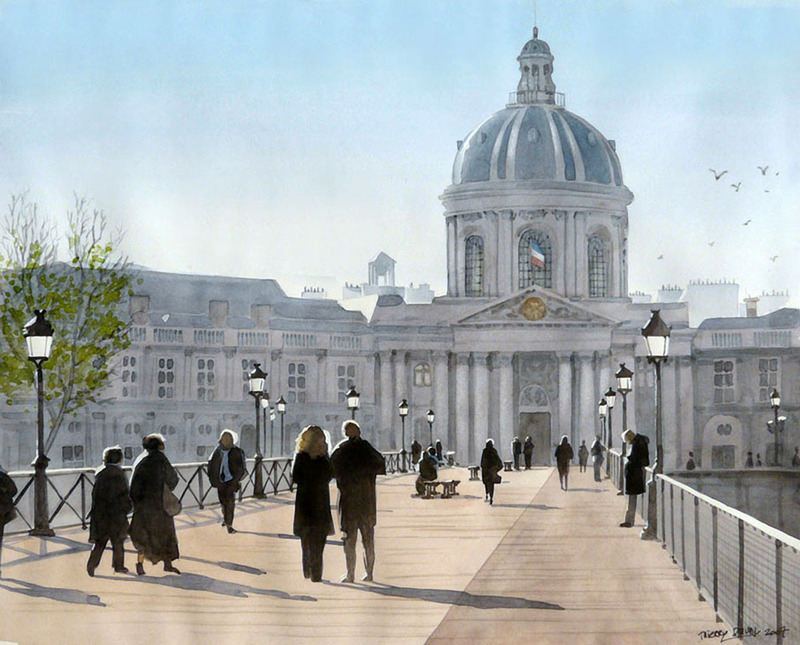 Thierry has exhibited in France and abroad, and he was awarded several times. 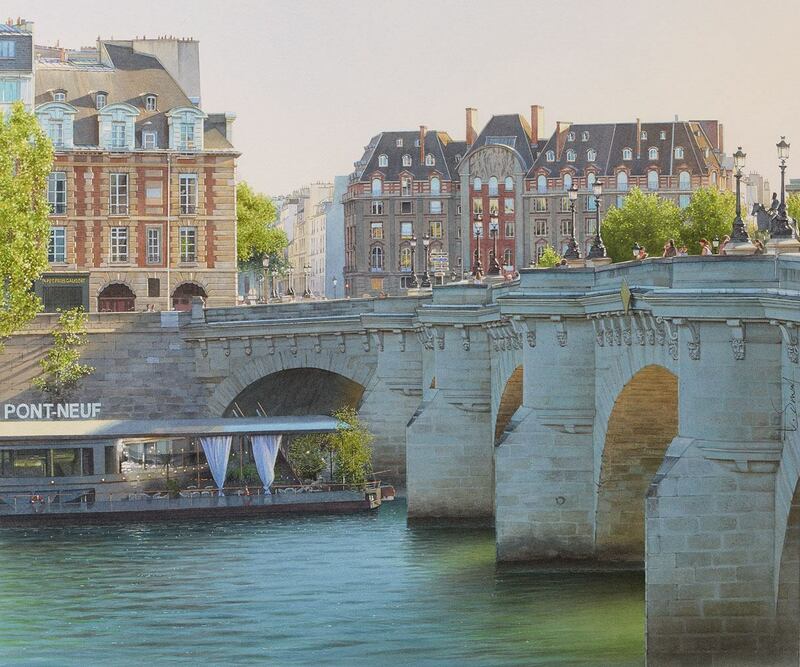 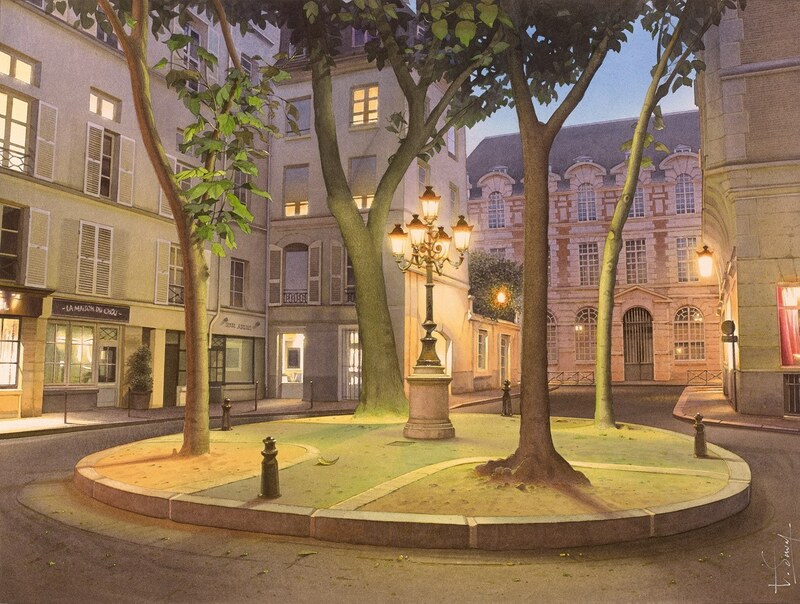 A graduate of Decorative Arts in 1982, illustrator, and creative in a large advertising agency in Paris, Thierry Duval drew and painted since childhood. 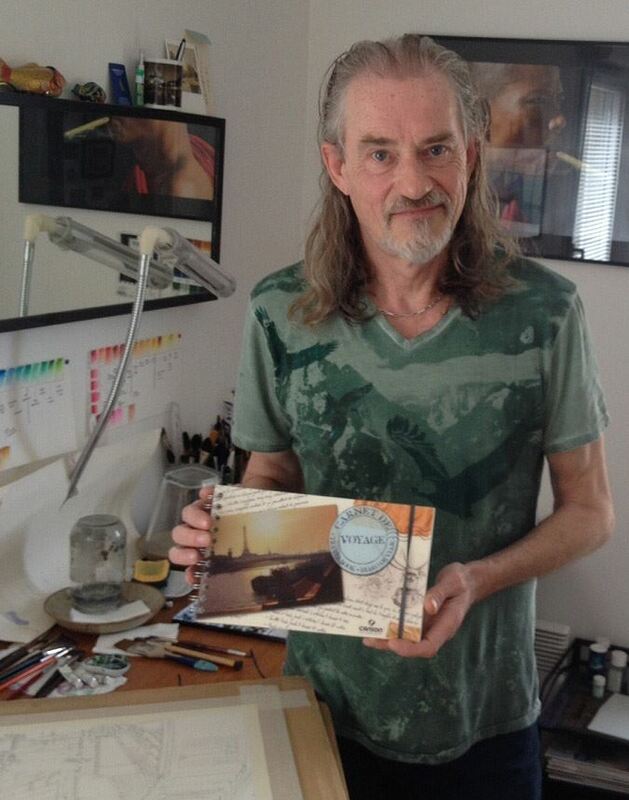 He will make his first creations using the concept of narrative comic strips from 1980, initially to a few fanzines, and in various magazines. 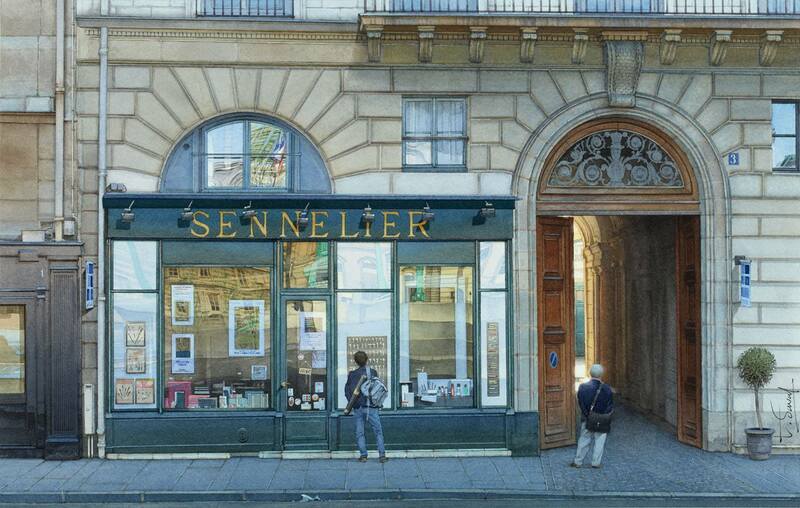 In 1990, a great Italian restaurant in Paris on "Raffaelo", commissioned the making of copies of pastel paintings of the Renaissance Raffael, maybe then it will taste for the great masters of academic painting. 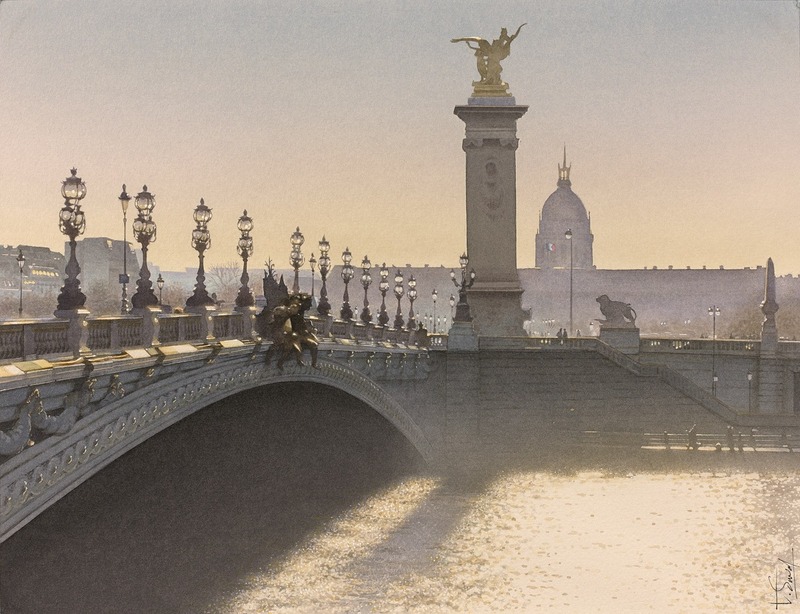 In preparing the entrance of Decorative Arts in Paris he discovered the work of the painter Delacroix, and that he will his passion for watercolor. 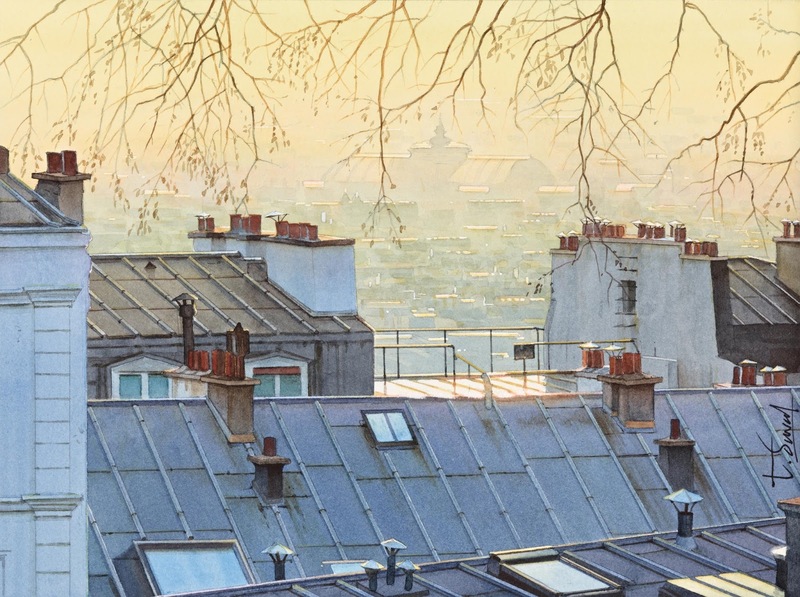 This technique will give a great freedom of expression. 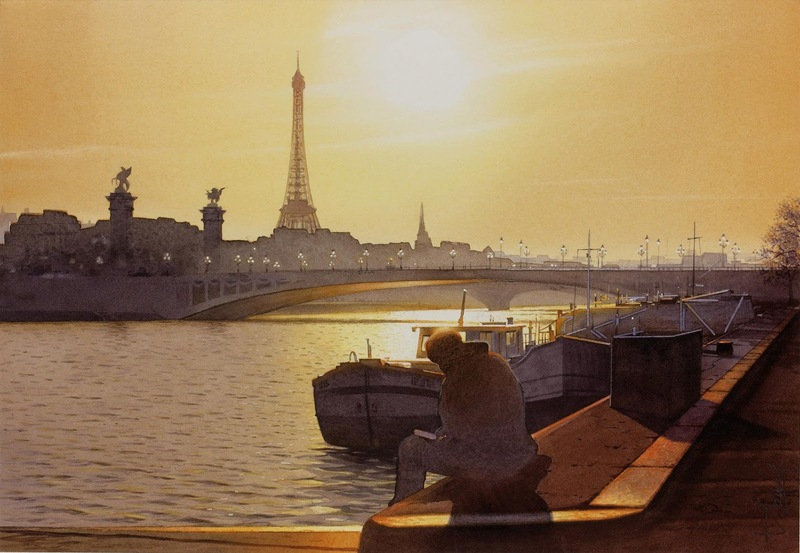 But his way of approaching watercolor is not common, in fact, his record, unlike the traditional watercolors, a force emerges in unusual colors and lights. 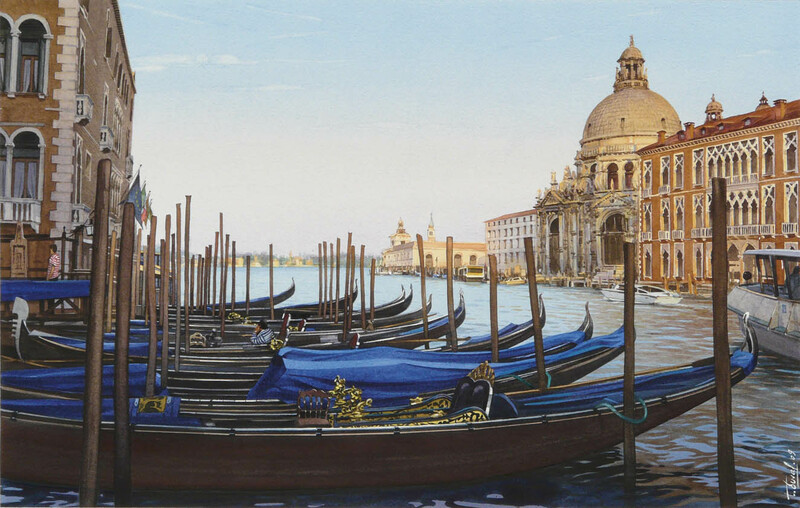 Its purpose is to evoke a "impressionism" of dawn or dusk depending on the themes, all supported by a drawing of a high accuracy. 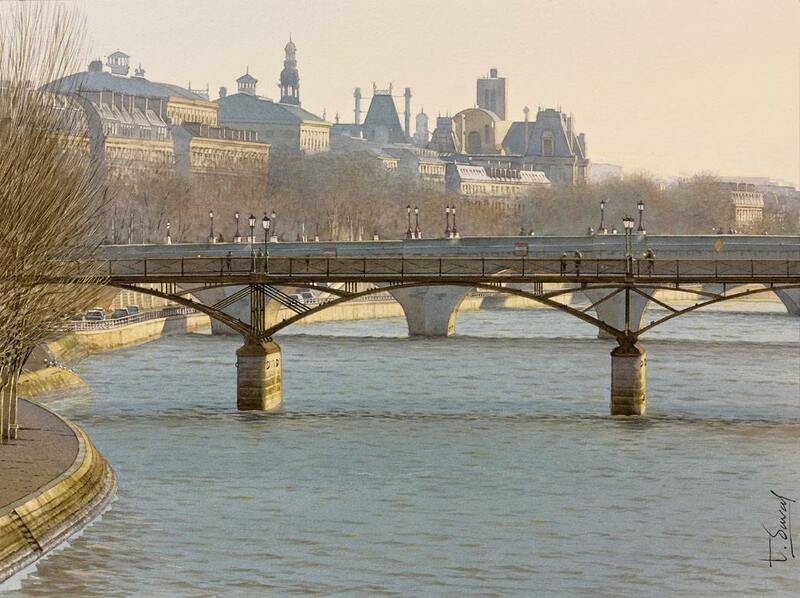 All these criteria give aquarelles Thierry Duval evocative power, a realism uncommon in the usual expression of watercolor. 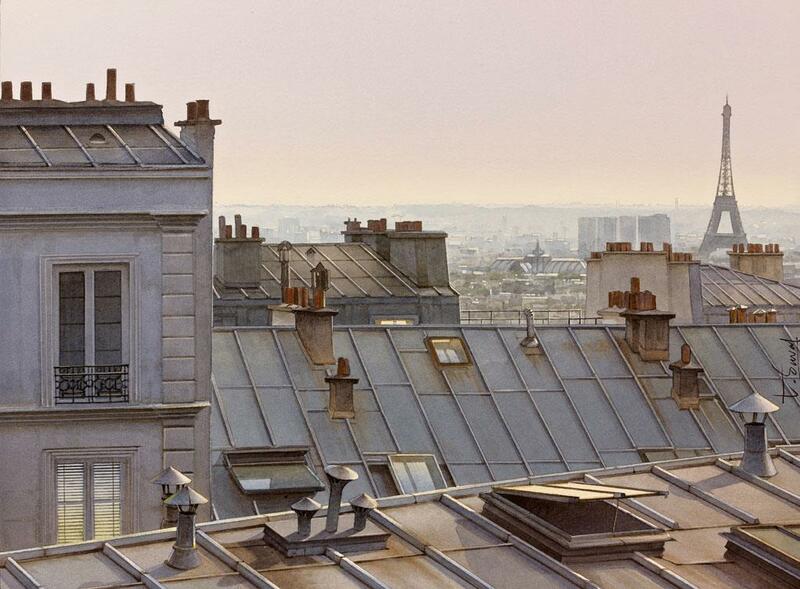 East and Paris are to important sources of inspiration: For the East, it draws, as Delacroix in his books trips to Morocco, multiple subjects: men and their lifestyles Berbère, the magic of the journey, but the harsh landscape bathed in warm light. 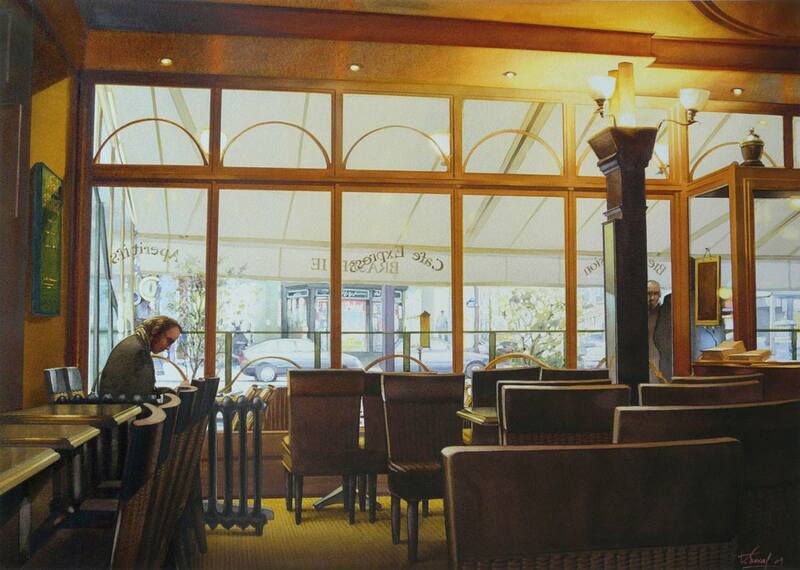 His watercolors are similar Orientalistes also part of the realism of the scenes, the painter Majorelle. 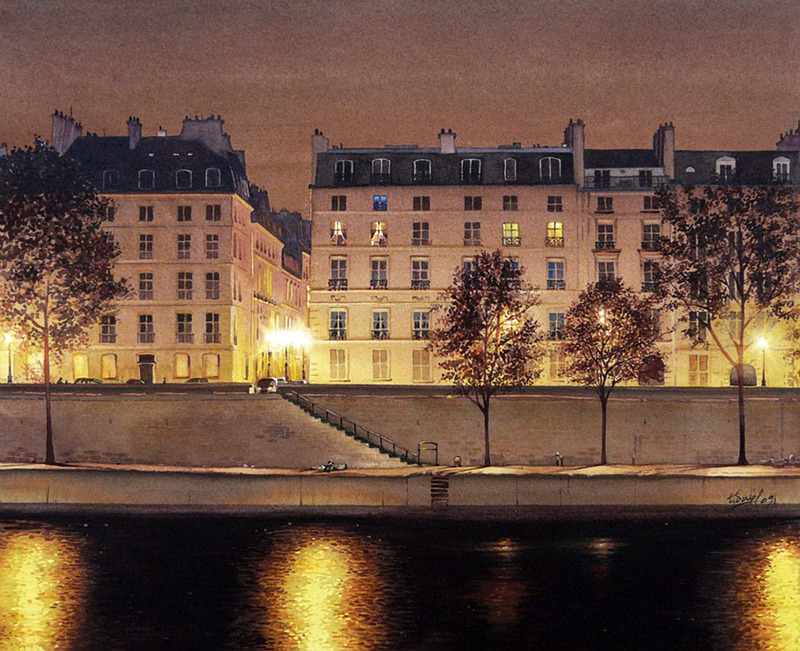 Regarding the theme of his work on Paris, he enjoys photographing the Seine in the early morning, he likes to filter light below decks, roofs gleaming in the rain, the silhouettes of majestic monuments that arose at the turn of an alley, the sounds of Paris, barges, markets, cafes. 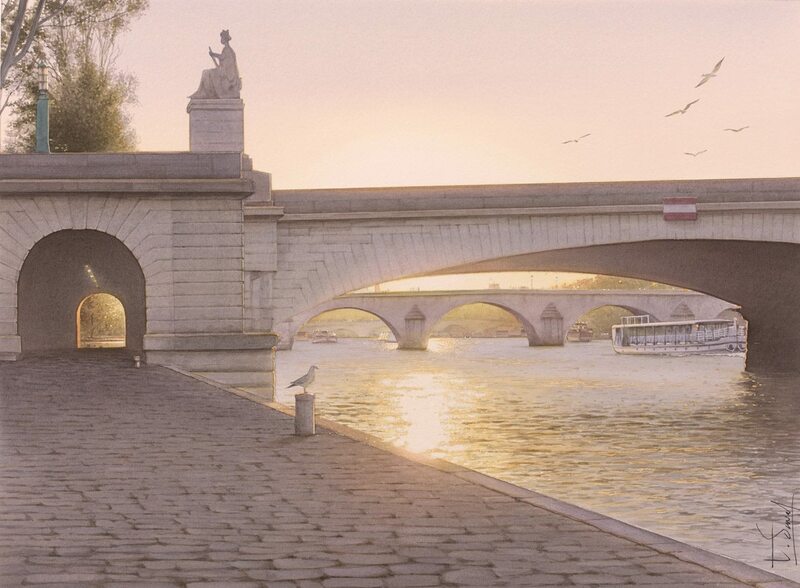 He likes to observe these lonely passers on the Pont des Arts, he likes to soak up the fall in Paris. 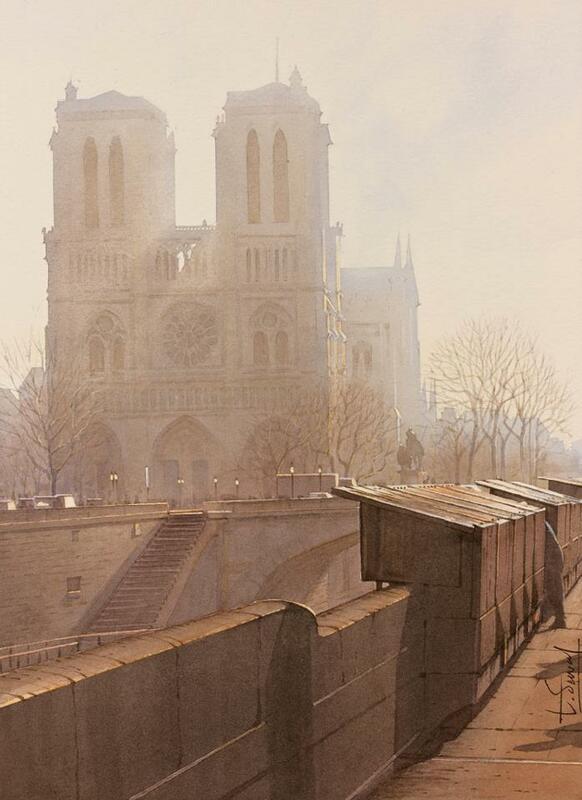 This photographic work, nourishes and inspires him in his painting: This leads to the realism of a Paris dreamlike, poetic, nostalgic and timeless. 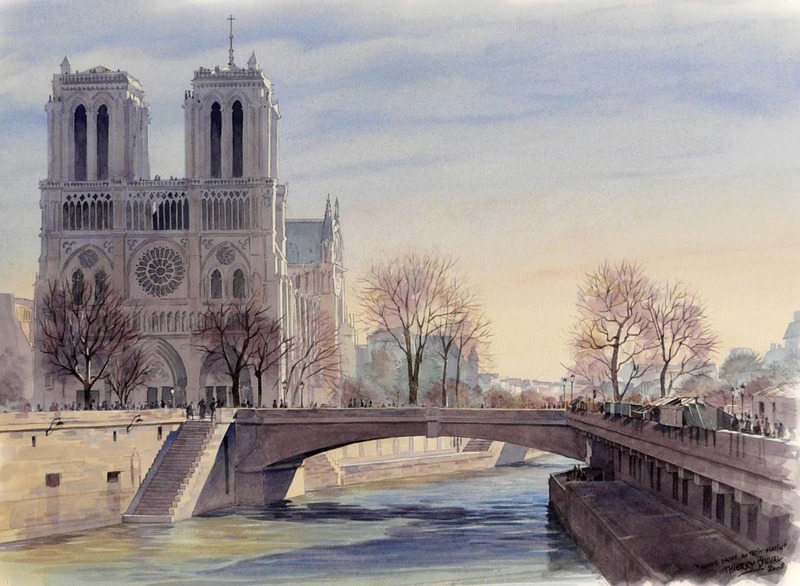 The singularity of his work rests on this dichotomy between a high tech modernism, (due to digital technology and its various applications), and conversely, a pictorial record which references s'impreignent rather large watercolorists classics of the last century. 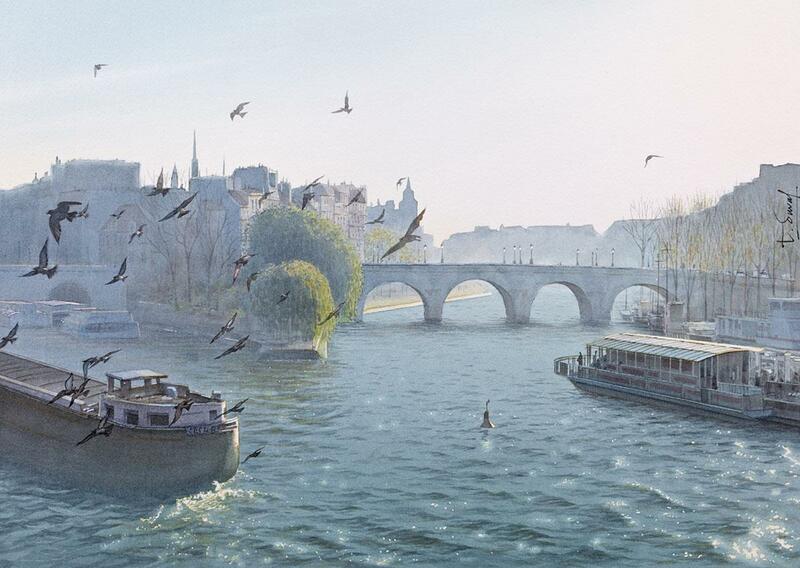 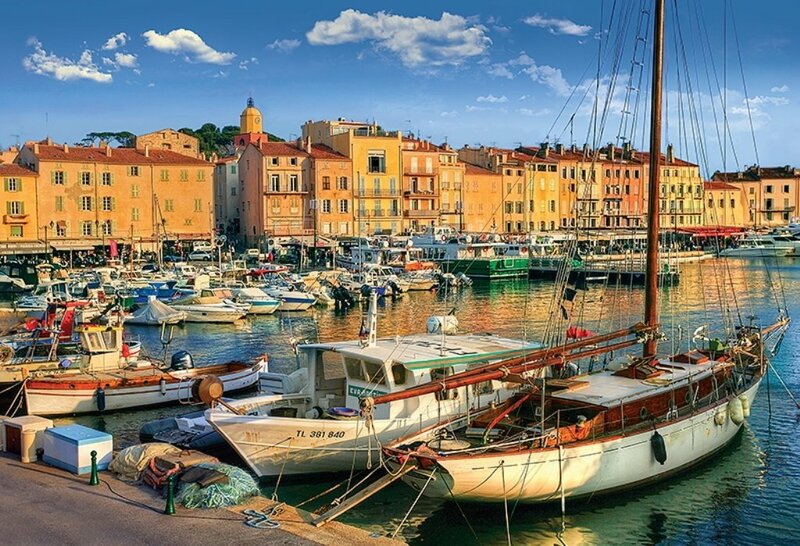 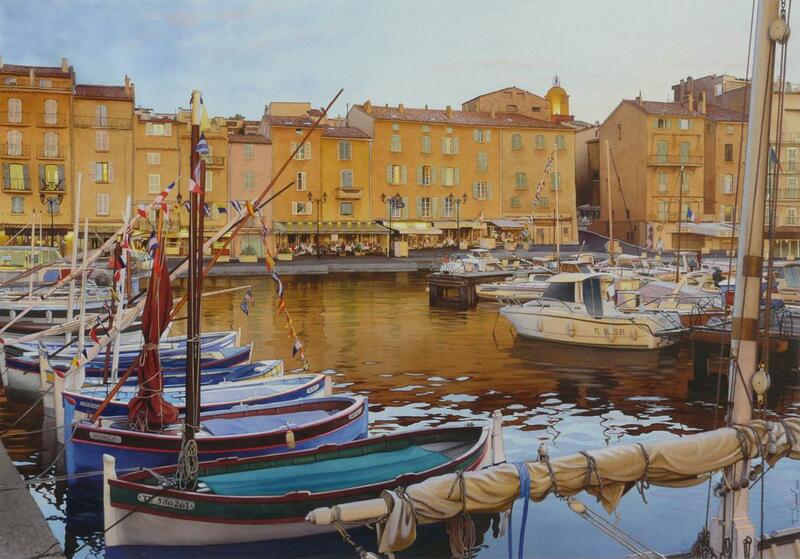 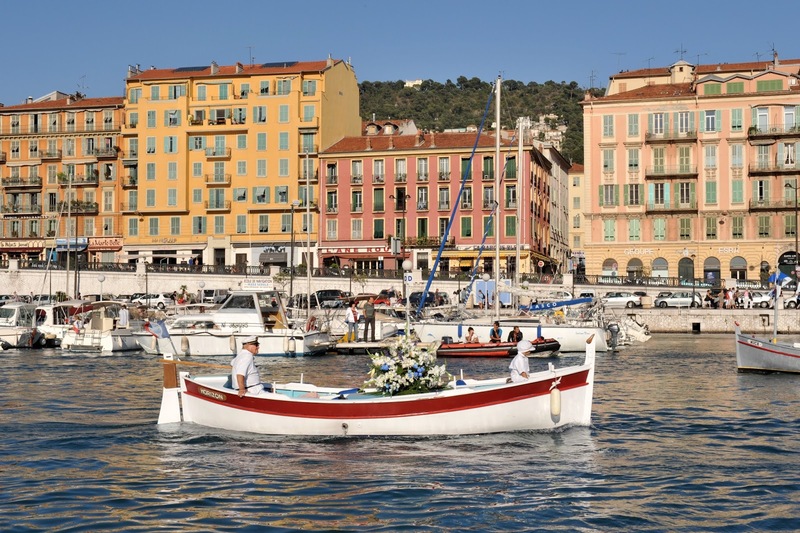 Worthy heir of the great British tradition of watercolor as William Turner, Thomas Shotter Boys, William Callow, James Holland, but also the work of Thierry Duval is a clever mix of hyperrealism, poetry and refinement. 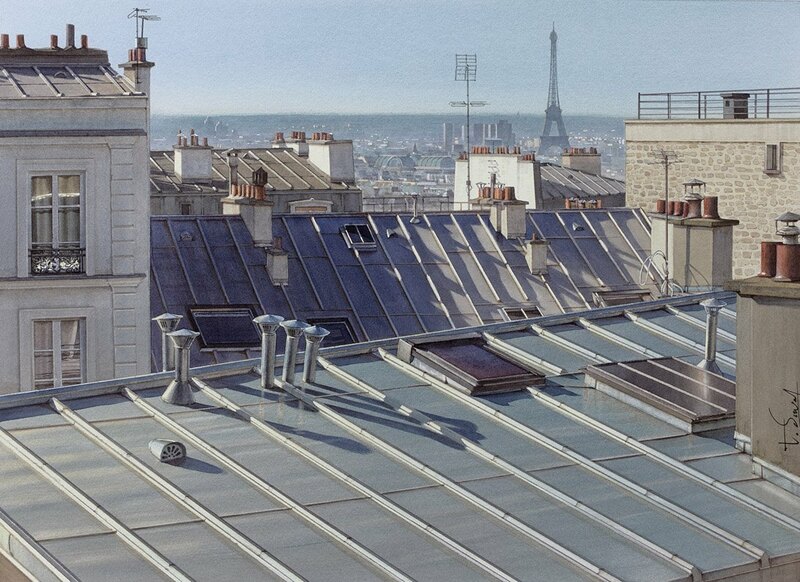 Thierry Duval is a sensitive and accurate observer of nature and the city, pay attention to the slightest variations of light. 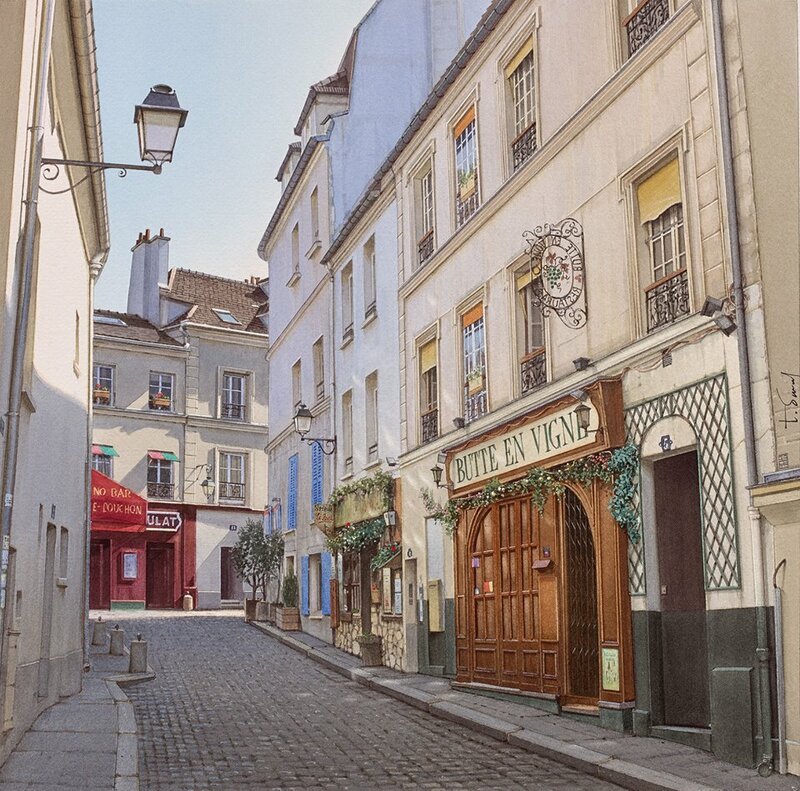 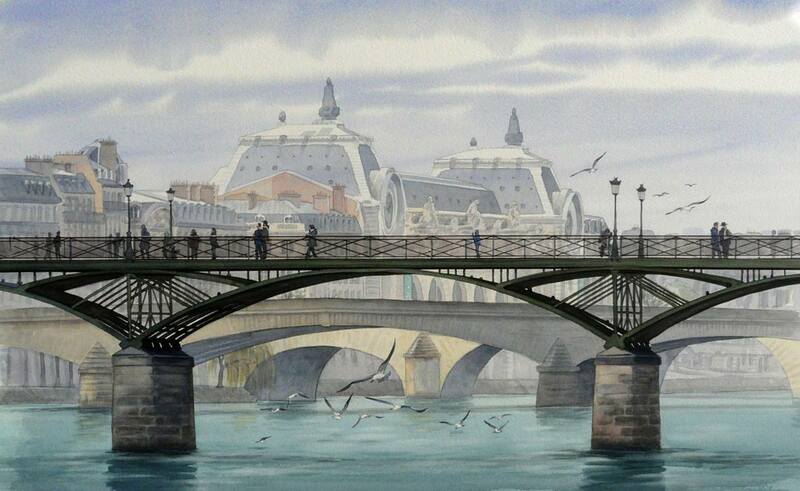 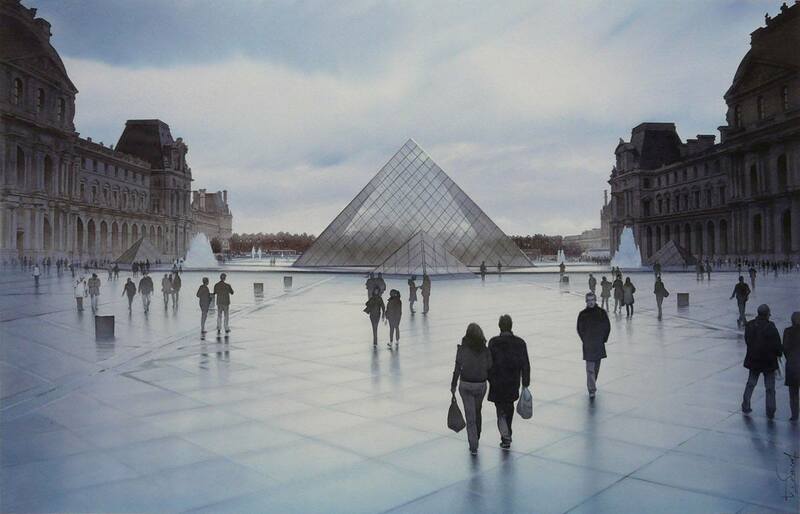 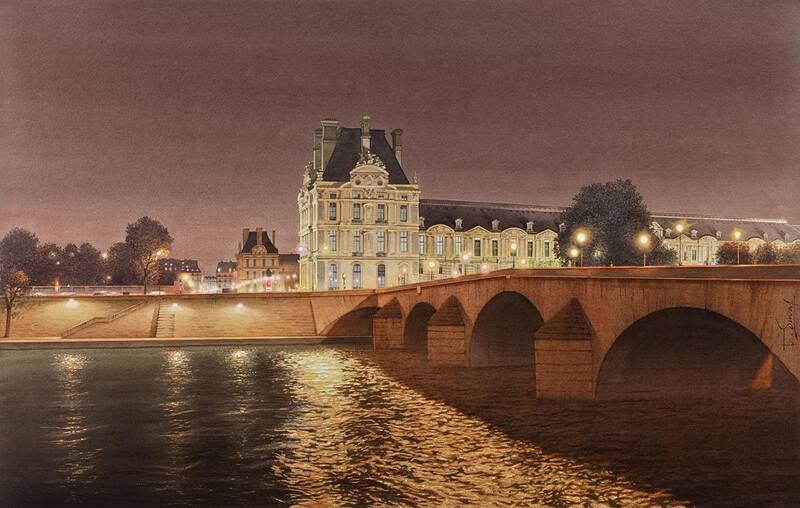 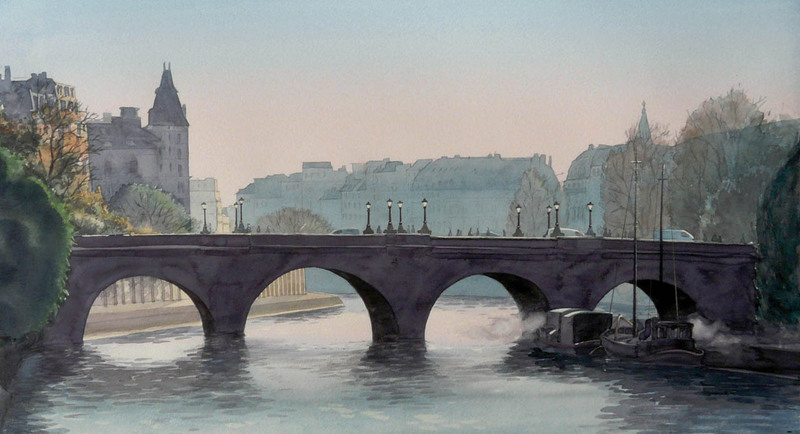 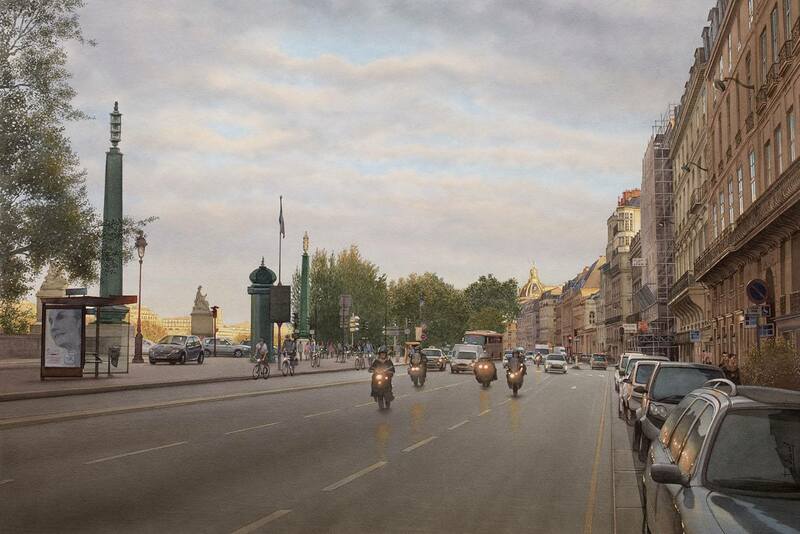 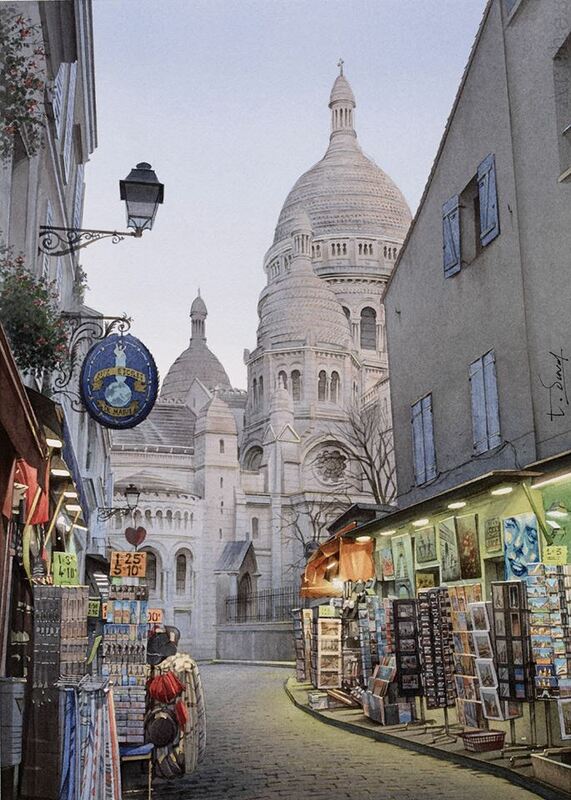 His watercolors of urban scenes recreate the beauty of historic Paris, but also the unusual and mysterious side. 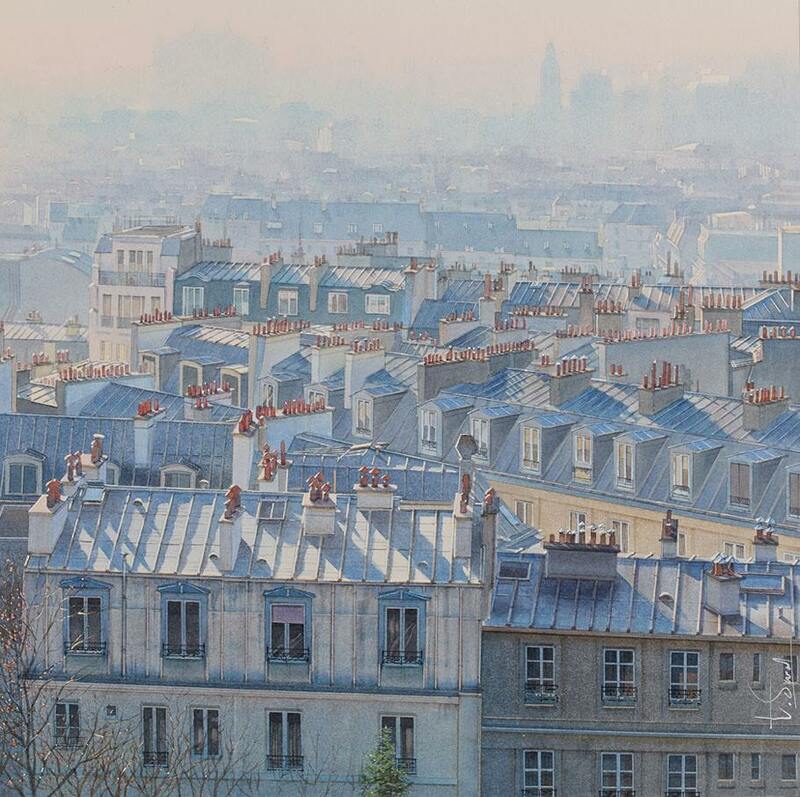 Since 2007 he exhibited in the United States in California in Palo Alto, and recently participated in numerous exhibitions in France and abroad. 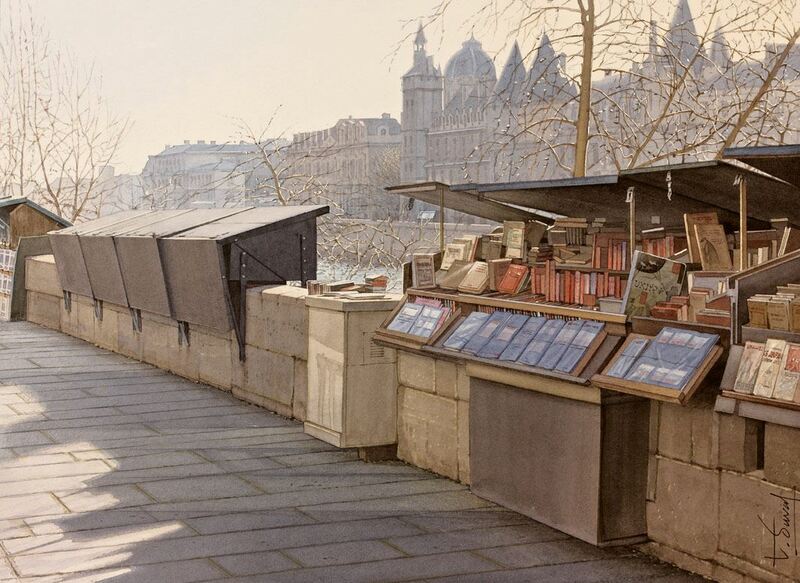 L'artista parigino Thierry Duval, diplomato in arti decorative negli anni ’80, si è dapprima avvicinato al mondo del fumetto e dell’illustrazione lavorando per qualche magazine. 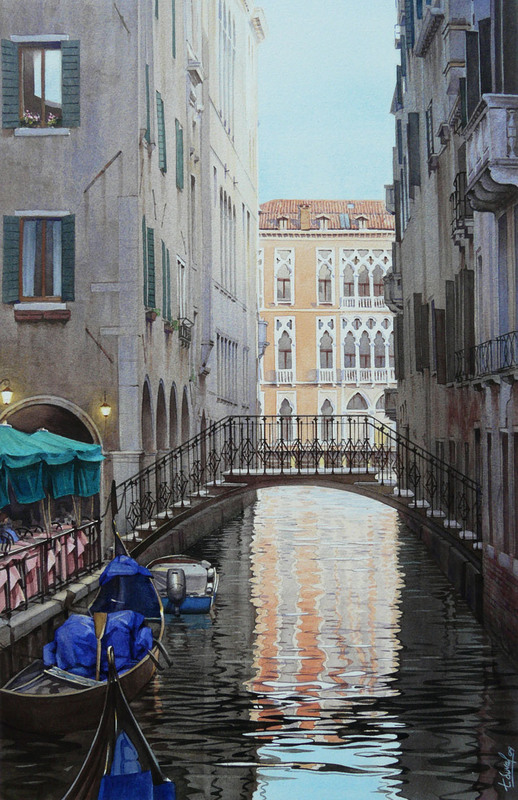 Solo negli ultimi anni si è dedicato interamente alla pittura, vendendo le sue opere sia su internet che in gallerie locali. 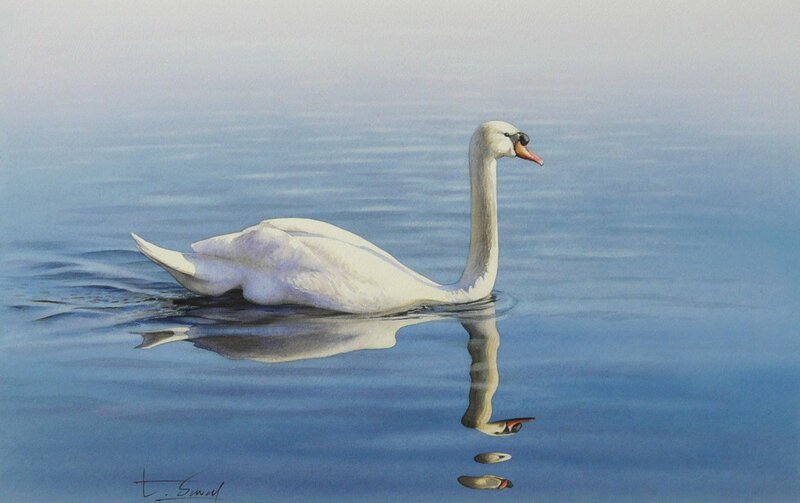 La mia opera è il risultato di un attento connubio tra l'iperrealismo e la poesia del luogo rappresentato. 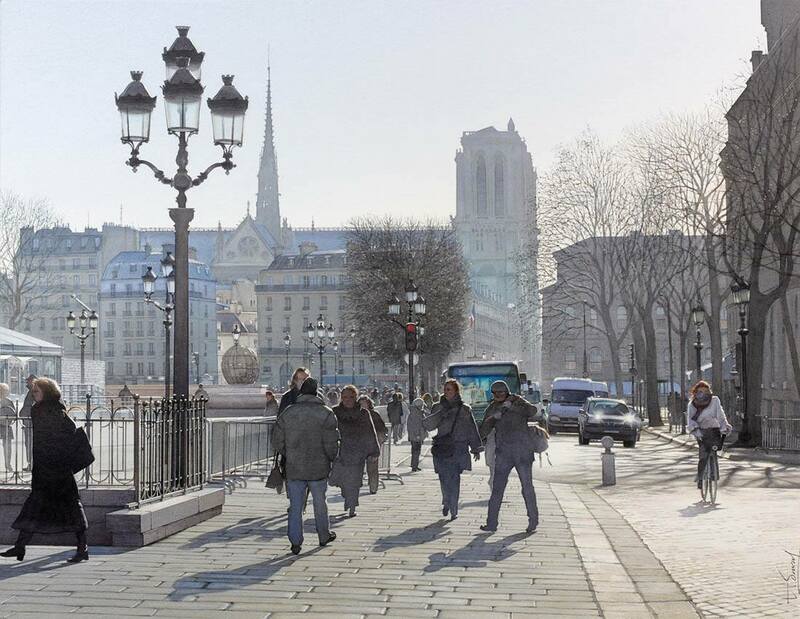 Spero di essere un osservatore sensibile e preciso della natura e della città, attento alle più piccole variazioni della luce. 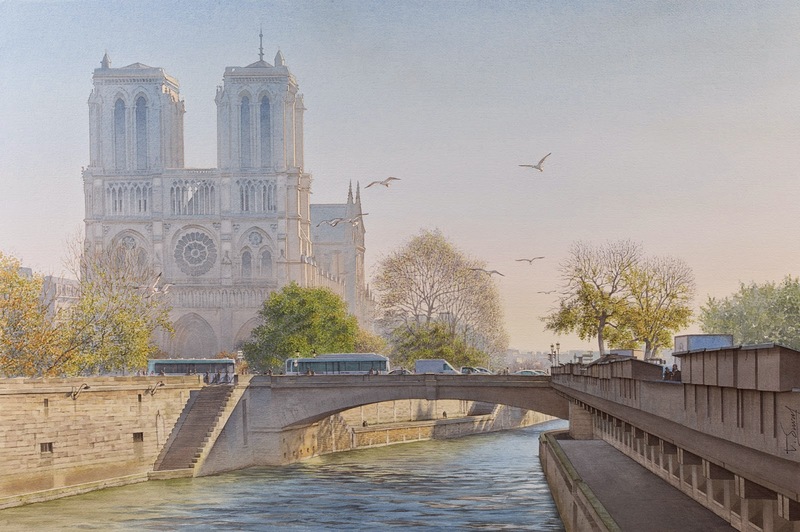 I miei acquerelli di scene urbane rievocano la bellezza storica di Parigi o Venezia, così come i loro lati insoliti e misteriosi. 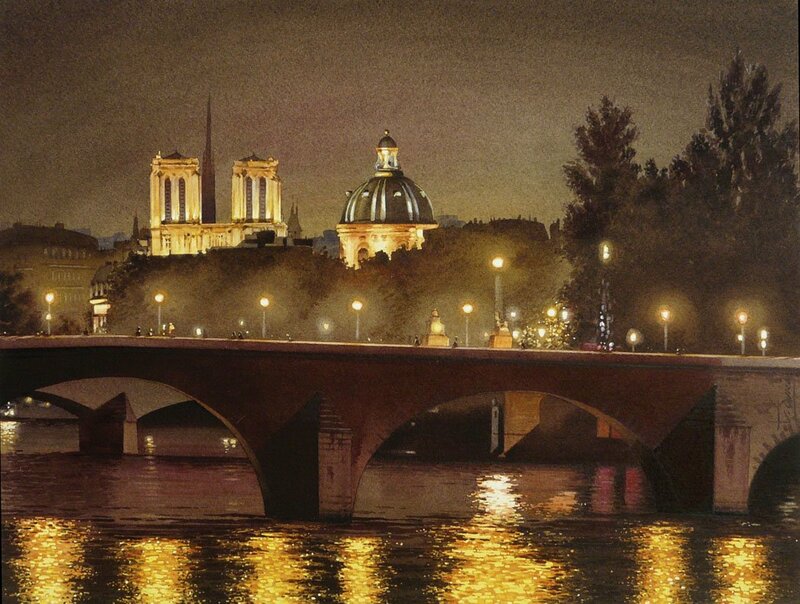 Mi sono laureato alla Scuola di Arti Decorative di Parigi nel 1982, e in seguito sono diventato un illustratore ed artista creativo presso una grande agenzia di pubblicità parigina; dipingo fin da quando ero un bambino. 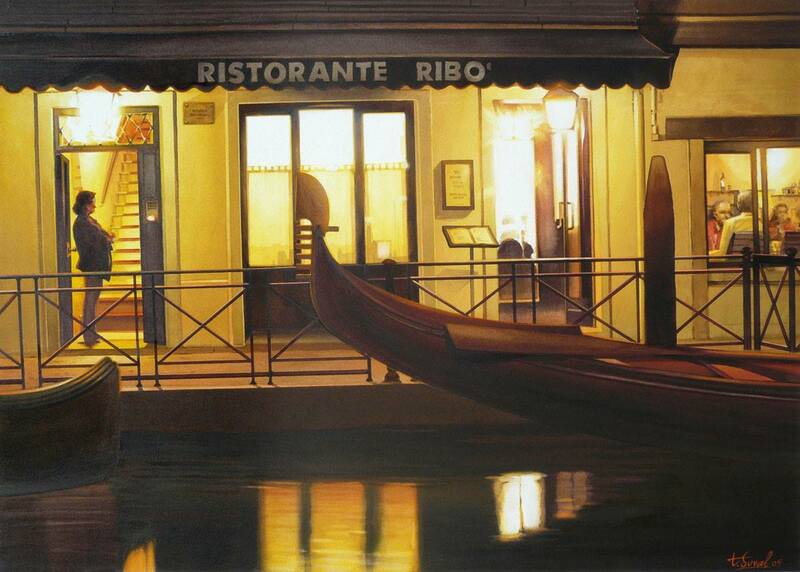 Nel 1990, un grande ristorante italiano a Parigi, Raffaélo, mi ha chiesto di creare copie a pastello delle opere del pittore rinascimentale Raffaello: da qui probabilmente nasce il mio gusto per i grandi maestri della pittura accademica. 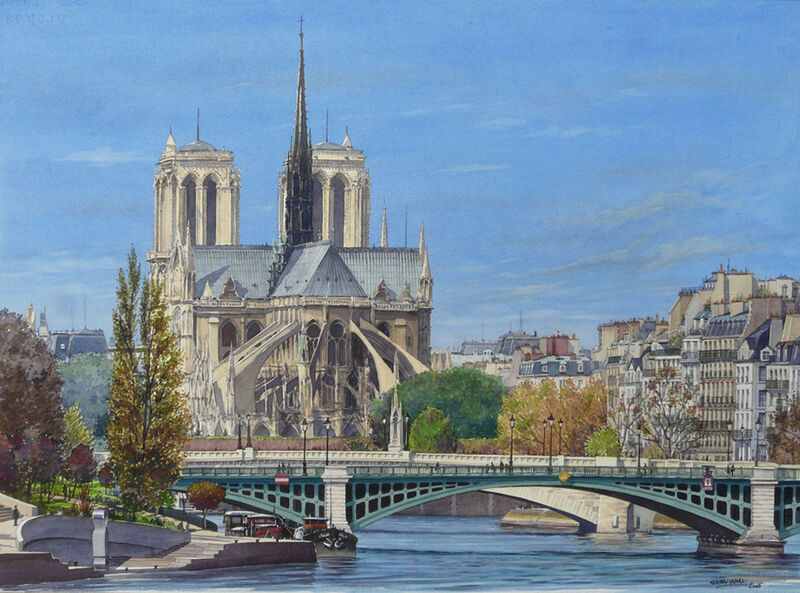 È stato durante la preparazione dell’esame di ammissione alla Scuola di Arti Decorative di Parigi che ho scoperto le opere del pittore Delacroix, che ha segnato l’origine della mia passione per l'acquerello.